Audrey realized her Ph.D. in the Quantronics group in CEA-Saclay, France. There, she worked under the supervision of Patrice Bertet on coupling bismuth donor spins to high quality factor small-mode-volume superconducting resonators. The experiments aimed to apply cavity quantum electrodynamics techniques to the field of electron spin resonance in order to improve the detection sensitivity as well as develop a spin initialization mechanism. She joined the Cleland group in January 2017 as a post-doc. Her current research interests are superconducting circuits, parametric amplifiers, spins in solids and various microwave transduction schemes. Hung-Shen received a BA degree in Physics from Cornell University, where he worked with Professor Gregory Fuchs on studying single quantum defects in ZnO. He is currently a PhD student in Molecular Engineering at University of Chicago. In the lab, his work focuses on developing quantum integrated circuits and interfacing them with other quantum systems with the aim towards quantum communication. Ming-Han received his BS and MS degrees in Physics from National Tsing Hua University, where he focused on understanding the statistical and mechanical properties of thin membrane. After that, he came to the University of Chicago, pursuing his PhD degree in Physics. 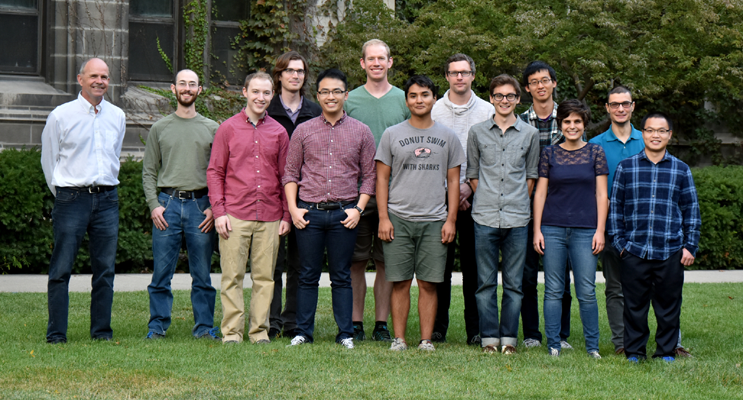 In Cleland's lab, his work is focused on optomechanics and hybrid quantum systems. In addition to his academia pursuits, he has a broad recreational interests including hiking, camping, as well as playing table tennis and softball. Andrew Cleland received his B.S. in Engineering Physics from UC Berkeley in 1983, and a Ph.D. in Physics from UC Berkeley in 1991. He was employed from 1991 to 1993 as a postdoctoral researcher in the Centre d'Etudes-Orme des Merisiers in Saclay, France. He then worked as a Senior Research Fellow at Caltech until 1997, when he moved to UC Santa Barbara. In 2015 he joined the Institute for Molecular Engineering at the University of Chicago as the John A. MacLean Sr. Professor for Molecular Engineering, Innovation, and Enterprise. He is also the Director of the Pritzker Nanofabrication Facility and a Senior Scientist at Argonne National Laboratory. Andrew Cleland's research is presently focused on three areas of research: the application of superconducting circuits to quantum information, including both computation and communication; the development of nanoscale devices integrating electronic, mechanical, and optical fields, targeting quantum control and quantum measurement of mechanical, spin and optical degrees of freedom. The propositions here demonstrated are adapted to the true constitution of the Earth, in so far as wheels moving in any of its great circles will describe, by the motions of nails fixed in their perimeters, cycloids without the globe ; and pendulums, in mines and deep caverns of the Earth, must oscillate in cycloids within the globe, that those oscillations may be performed in equal times. For gravity (as will be shewn in the third book) decreases in its progress from the superficies of the Earth ; upwards in a duplicate ratio of the distances from the centre of the Earth ; downwards in a simple ratio of the same. And therefore in clocks, if forces were impressed by some machine upon the pendulum which preserves the motion, and so compounded with the force of gravity that the whole force tending downwards should be always as a line produced by applying the rectangle under the arc TR and the radius AR to the sine TN, all the oscillations will become isochronous. Etienne was born in Morez, a pretty town in Jura, France. After studying at the University of Besancon he moved to Grenoble, France, where he completed his Master's degree in condensed matter physics at Joseph Fourier university (Now retitled Grenoble-Alpes University). His PhD was carried out under the supervision of Olivier Buisson at the Neel Pnstitute and cosupervision of Max Hofheinz at CEA Grenoble about the experimental implementation of a V-shape energy diagram in superconducting quantum circuit and the fabrication of microwave resonators in Rhenium. He joined the Cleland team to study hybrid systems involving SAW and qubits. Rhys received his BSc and MS in physics from the University of Western Australia working on microwave cavity experiments searching for dark photons. Following that he came to the University of Chicago to pursue his PhD and, after a brief stint in high energy physics, joined Cleland's lab. His research is focused on quantum communication with optomechanical crystals. Youpeng Zhong received his B.S. in Physics from Zhejiang University in 2013, then worked in Prof. Haohua Wang's group for two years. In 2015, he became a PhD student in Institute for Molecular Engineering, University of Chicago and joined the Cleland group. His current research focuses on quantum communication with superconducting qubits.